Over at the new Law & Mind Blog, several Harvard Law students have been blogging about about system justification theory. Here is one of those posts, written by first -year student Marty Ehlenbach. 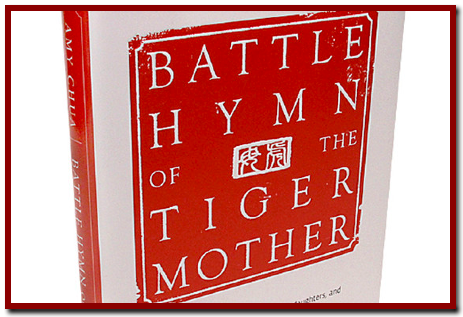 Yale Law Professor Amy Chua’s recently published book Battle Hymn of the Tiger Mother has become a seemingly endless source of fodder for Internet blogs and discussion groups. The book, largely meant to be a memoir, recounts the author’s methods of raising her two daughters; she allowed them limited time for playdates or TV, and describes grueling methods for both study and music practice. When a short excerpt was published in the Wall Street Journal, the newspaper fielded an enormous number of comments (7670 at this writing) expressing a wide variety of opinions on the topic. Even The Onion has weighed in on the subject. Why does this book seem to resonate with so many people? One possible explanation is that it makes a distinction between a “Western” and “Chinese” parent in a time when many people seem to be particularly sensitive to any sort of cultural comparison. Chua’s stereotypical model of “Western” parenting describes a childhood lacking in any discipline and in some ways signifying a lack of commitment by parents to make their children into the most successful people possible. A New York Times article underscored the idea that there are many different types of skills needed to be a success, and believes that Professor Chua’s parenting style does not appropriately develop “soft skills” like communication and teamwork necessary in most business environments. I am deserving. My group is deserving. And, fortunately, we live in a system that has the wisdom and justice to reward deserving people. Chua writes that “tenacious practice, practice, practice is crucial for excellence,” but this idea necessarily presupposes that with excellence will come success. It doesn’t really address the differences in educational opportunities available to many children, but seems to have faith that the current system will treat people fairly by recognizing hard work. Losers in the system are clearly “lazy, unintelligent, poorly educated, or irresponsible” as described by Jost. Jost and Blasi recognize that system justification theory can be used to analyze ideologies like the Protestant work ethic and a belief in a meritocracy: Chua’s entire child-rearing method has aspects of both. Another interesting connection between Jost’s theory and Chua’s book is the possibility that Chua could be providing ultimate justification for the type of upbringing that she experienced. The article on SJT shows that even on a micro-level, within a particular family, people still use methods of ego and system justification to perpetuate particular social arrangements. Chua herself was clearly raised by fairly strict Asian parents; she describes her father calling her “garbage” at one point when she was disrespectful. One wonders if this book is simply a way to legitimize her own upbringing and defend her willingness to create a similar type of relationship with her own daughters. Chua’s daughter Sophia, in an open letter defending her mother’s treatment, says that she “decided to be an easy child to raise”: the fact that she called it a “decision” could be an early justification for her own upbringing, and might show an early willingness to conform to her parents’ expected behaviors. Many of those commenting on the articles who described themselves as being being raised by parents similar to the “Tiger Mother” also spoke about how much they appreciated their parents’ tough love. Chua’s story has important implications, I believe, for our legal system as pertains to victims of abuse. I do not mean to suggest that Chua’s methods constitute abuse; her goal was clearly to help her children be successful, and as one article described, shows a fear that success is becoming difficult to obtain in a world of increasing competition and a less than robust job market. This is a legitimate worry. Furthermore, I cannot pretend to understand the complex relationship between another parent and child, because they are quite unique and often complicated. However, recognizing that this justification can satisfy “needs for consistency, coherence, and certainty” as described by Blasi and Jost, and analyzing one woman’s story through this lens, leads one to wonder how the legal system could account for a demonstrable bias towards the status quo. Before a real abuse victim can come forward, she or he must be able to recognize that she does not actually deserve the behavior to which she is being subjected, and SJT posits that this recognition is not automatic. Furthermore, we don’t want to believe that our system is corrupt, but in many cases it is not the most hardworking who become successful, and frequently injustice is neither obvious nor easily corrected. Over at the new Law & Mind Blog, several Harvard Law students have been blogging about about System Justification Theory. Here is one of those posts, written by first-year student Michael Lieberman. The rate at which repeal is ostensibly progressing is somewhat of a surprise given the strong objections to repeal voiced by members of Congress and the Military throughout the policy’s history. The insights of system justification theory (SJT), as described by Blasi & Jost, can help explain the apparent mismatch between the vehement opposition to repeal and the complicity (and perhaps even vigor) with which it is being implemented. By examining the public comments of one particularly strong critic of repeal, Senator John McCain, I will explain this apparent mismatch by invoking the insights of SJT and other mind science theories. McCain has been a longtime supporter of DADT, often buttressing his stance by noting that several military leaders had also professed support for the policy. In a 1999 interview that typifies McCain’s historical stance on DADT, McCain told the Boston Globe that he supports the policy because “Gen. 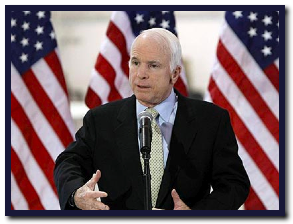 Colin Powell, Gen. Norman Schwarzkopf, all of the military leaders that I respect and admire came up with this policy … They thought it was the best way to address a very difficult problem within our military.” However, recent insights from the mind sciences suggest that McCain’s cited rationale for his policy stance may not be the true source of his policy attitude. As Jon Hanson and Mark Yeboah note: “our reasons, far more often than we can perceive, are not connected to our behavior as much as they are rationalizations or confabulations to help make sense of that behavior.” Sure enough, even when Powell changed his own stance on DADT, Senator McCain continued with his opposition.